Roy Halladay's Memorial Service Captured The Best Of "Your Favorite Player's Favorite Player"
It’s now been a week since Roy Halladay was killed flying a small plane over the Gulf of Mexico. 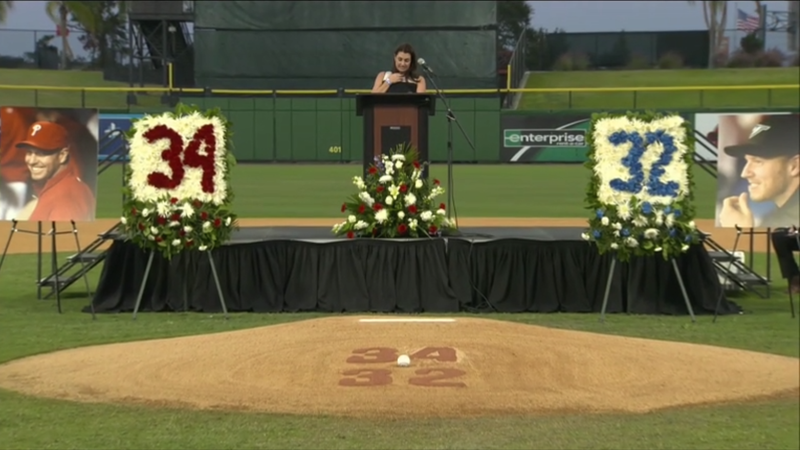 Most of the public eulogizing that’s come pouring out over the last several days has centered on his incredible talent—and how can it not, when someone could pitch like that—but today offered some more intimate testimony, with MLB livestreaming the former pitcher’s memorial service. At the Philadelphia Phillies spring training facility, not far from Halladay’s Florida home, a handful of speakers confirmed that, yes, he really was as wonderful a guy as you thought he was. Several former teammates shared their memories of Halladay, including Chase Utley, Chris Carpenter and Cole Hamels. The final speaker of the afternoon was the hardest to listen to: Halladay’s wife, Brandy, who shared what her husband meant to her and everyone who knew him. “I don’t know how to be me without him,” she said in the final minutes of her speech. “I didn’t know how big my heart was until I felt the amount of hurt in it with him gone.” She described how fiercely he loved his family, how he cared for the dogs they fostered, how he enjoyed so many little things in his everyday life—a fitting end to a service that suggested Halladay, as great a pitcher as he was, was an even better person. Roy Halladay Was "Your Favorite Player&apos;s Favorite Player"